What is the best style of leadership? What is the ‘right way’ to lead? We are all looking for the answer to that question. And there is only one style of leadership – your style. I am in the process of writing a new book at the moment, called The Inspirators – the next generation of leadership. As part of the work on this, I have been interviewing inspiring leaders from some of the most well know organisations around the world. As a result I have seen how each of these individuals has their own particular style. They all do things in their own way and they are all successful. They understand that they can lead their organisation to achieve its goal by unlocking the potential in everyone around them and bringing forth the next generation of leaders. What’s the difference between you and an acorn? The difference comes in the decisions we make. The acorn grows because it must. We grow because we can and a truly inspiring leader know that and looks at how to how those they lead how to express themselves to their fullest potential. Inspirators are all different but they all have certain things in common too. They have a clear vision of where they are going and why they are going there. They clearly express that vision to those around them. They are true to themselves in everything they do. They are self-aware and, while they may adapt to circumstances, they are 100% authentic in how they do everything. They are the example. They never seek to change others to fit in with their way of thinking. Instead they work on themselves, working to be the best leader they can be (both personally and professionally) and, in this way, showing others how to be their best too. They understand that this is journey. Just as in any good film, there are ups and downs, friends and enemies, highs and lows, so too, in the journey to become an inspiring leader is not without its challenges. That is why I have made the leaders journey the heart of the book – to inspire people to go on their own journey to become the best leader they can be. I’m not seeking to create a new type of leader. Inspirators are already out there. People like Patti Dobrowolski who features in the short video above and leaders like Patrick McKenna MD of Owl Financial who Patti and I recently had the privilege to see in action. 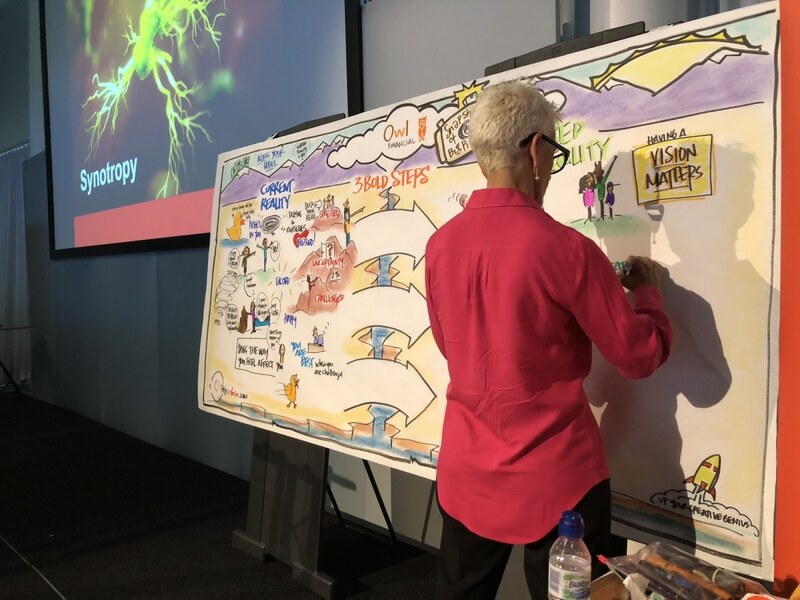 I was giving the keynote speech and Patti was creating a visual recording of the day. At the end of the day, in his summing up, he was amazing. He was everything you want in an inspiring leader. In a few short sentences he gave his team Autonomy, mastery and purpose so that they can really connect with his vision for Owl and support him in his mission. As a result of this and all his work to inspire, every individual left that room seeing themselves as leaders with the power to use Syntropy to grow both personally and professionally. What do you think are the most important characteristics of an inspiring leader? I’d love to hear your opinion on great examples you’ve seen and what you have learned from others. Add your comments below and join the debate. Pete Cohen is one of the world’s leading keynote speakers. Hundreds of thousands or people from all over at the world have been motivated and inspired by Pete’s presentations. Copyright Pete Cohen | All Rights Reserved.